Some people seem to crush Glint levels in a matter of hours. Others find it to be too stressful and much too difficult. The solution? Adaptive gameplay. Simply put, each time you fail at a level, that particular level will get a tiny bit easier. Designing the levels for Glint has required delicately balancing a bunch of parameters to keep the game fun, rewarding, and challenging. This new change will keep the existing balance while offering a fun experience for those who felt the game was too difficult. "There truly is a glint to every match you make, and there’s simply such a high degree of detail that shines on retina displays. Every time you open the game, you can just be prepared to have a smile on your face with the way the game tantalizes your visual, and touch senses." Sorry for all of the Glint noise lately - reviews are just too awesome to skip! Glint is #17 in the US of A new puzzle charts on iTunes. Thanks, AppAnnie. If you haven't grabbed it yet, you should - it's free. Tell all your friends! I got to meet Robin from AppAdvice yesterday at PocketGamer's Big Indie Pitch event at 111 Minna Gallery. She's awesome, as is the entire team at AppAdvice, and did a video review of Glint, which you can check out above. Coming in the next release - an easier version of Glint. Marketing sometimes feels overwhelming and confusing. Moments like this are awesome. The Star Wars dude in the background is a nice touch. As many of you know, I’ve spent the last 8 months working intensely on my first mobile game, Glint. When I left ILM, I knew that as sad as it was to leave after so long, it was the right decision if I wanted to get back into producing my own content, which I desperately missed. Towards the end of my seven years there, I saw mobile app and game development explode into a mature platform for content distribution and I decided that it couldn’t be a better time to make some decisions. Many long months of ignoring important friendships, family and personal obligations, I’ve finally released my first game. While it may seem simple from the outside, it was actually a pretty grueling process of design, development and testing. I’m lucky to have so many supportive people in my life. Seriously, whether you know it or not, I could not have finished this project without the insanely awesome support of my friends and family. You have all encouraged me from the beginning whether you know it or not. From the obnoxious nature of simply hearing me talk about it constantly through forcing everyone I know to install early builds on their phone and play test for me, your support is remarkable and I love you all. My wife is amazing. Simply put, she is utterly amazing. At times, I wonder what she’s doing with me and how it is that she is so unbelievably supportive and caring. To have her support through some pretty crazy times means the world to me. I love you, lady. To everyone I have neglected over the past long while, I will make it up to you, and I am sorry for being so selfish. I hope you can understand how important it was for me to get back to my roots. Conor - I can't thank you enough for lending your ear and sound skills to Glint. You've created some epic sounds that make the game what it is. If you’re friends with me or connected to one of my awesome friends or family, you’re probably tired of seeing Glint related posts. You’re gonna see more and I hope you can understand. Please, help support Glint by downloading it, rating it and tossing up a comment in the app stores. It’s free and available on iPhone, iPad & Android and it will make the long development process so much more rewarding. Thank you, everyone! Seeing any coverage of Glint is exciting, especially when it's in another country. 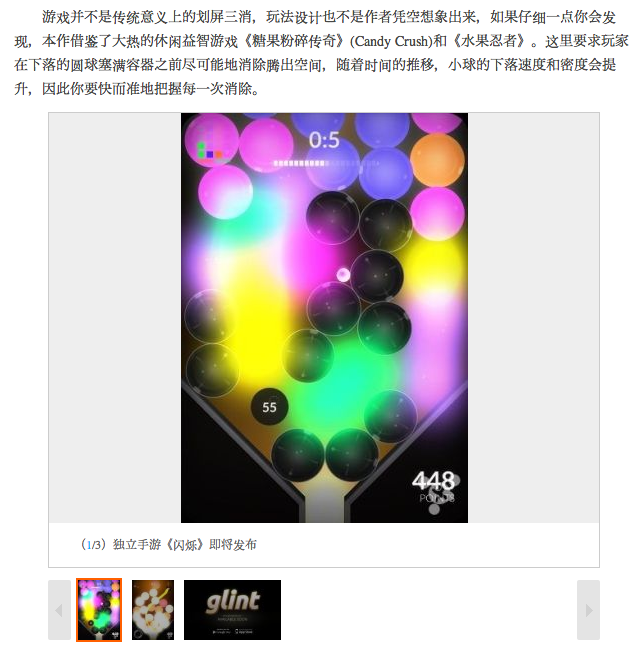 This morning Google News reported that a story was posted about Glint in China. Using Google Translate, I've pulled my favorite... quotes. "...if you look closely you will find that this work draws hot casual puzzle game 'Legend of crushed candy' (Candy Crush) and 'Fruit Ninja.'" "...in addition to achievements and mission systems, overall quite good fun." "Here in the whereabouts of the ball requires players to eliminate as much as possible before to make room filled container." "I believe that within a few days will be able to play on this masterpiece." "Gelatinous cube eats medieval city"
What happens when you reach the end of Glint? Since all of the levels in Glint are manually created, there's got to be an end - eventually - until more can be built. Some of our beta testers (Katie) have reached that lonely end. 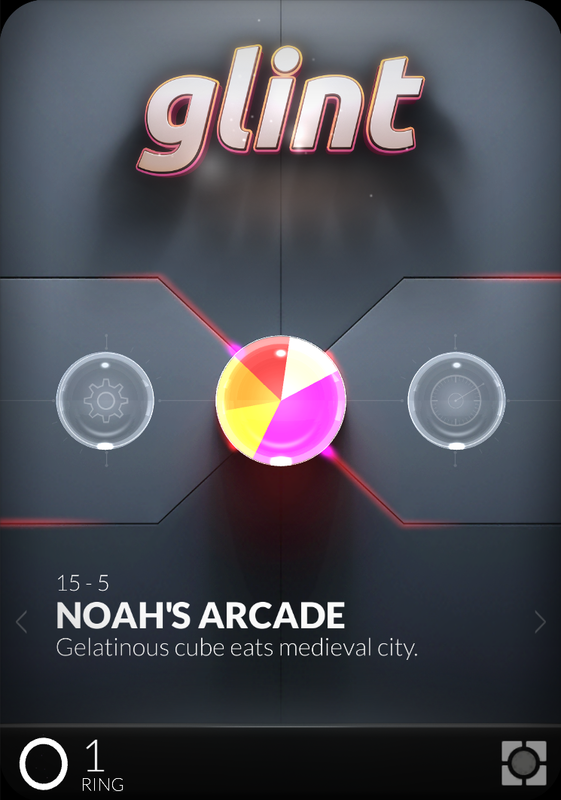 Moving forward, when you reach the last built level of Glint, you will be presented with the "Noah's arcade" of levels. Get those quarters out. I ditched the original icon for Glint and created a newer, sexier, icon for Apple. They're big on icons and I wanted to make sure they weren't disappointed. Above is a time-lapse showing the quick process. For posterity, here is what the old icon used to look like. The icon on the left frequently got lost on the homescreen and I wanted to make it look more like the start screen launcher. A little research shows that people really like circular icons that contain blue and green. That's all I've got. "Level 22 is the most fun level so far - possibly because I am intoxicated." Designing games is tough. Coding them is tough, too. As Glint sprints nearer to production-ready, level design is in full swing. My initial thought was that once the level editor was created, it would be a snap to go through and power-out 100 levels. After starting level production last weekend, I realized that it would take a lot more time to make the levels feel just right. Level 1-5 - Simple, but time consuming. Level 6-10 - Okay, this requires a lot of time and attention. Level 11-20 - Two days have gone by. I'm losing my mind. Level names start to become things that I see lying around my house. "Kitty face" - level 15 is called. Level 21 - Nobody ever said "You shouldn't design levels while drinking". Game design might be the most maddening thing I've ever done. I'm also growing a beard. God, I hope you like this game. To create levels quickly, I coded a simple level editor in HTML5. The level data is uploaded to my server and downloaded to my dev box where it's instantly compiled into a data file that is consumed by the game. Our cat loves Glint. In particular, she loves the start screen animations. Unfortunately, she isn't very smart and occasionally tries to claw at the screen. When she was young, I set her up with a tiny cat-sized computer and tried to teach her how to code, but that was a waste of time and money. Normally I wouldn't post a picture of my cat on a development blog, but Indie Game Girl said "people love cats". I am neurotic about saving all of my old devices and making sure that apps I write work on each of them. When I code interfaces, I determine the size of literally every element based off of the device screen height and width. That ensures my interfaces scale to fit phones and tablets, on any operating system. I can't remember the last time I hard-coded a pixel value. I'll do another post at some point detailing my passion for never hard coding pixel values - it will be a long one. This is a quick "making of" video illustrating how I construct widgets. This particular video shows how I prototype the widget in Photoshop, construct it in Maya and finish it inside Unity. I'll add new posts as I have time - or, once a week, as Emmy suggests!